A recent news article from ABC 6, takes a look at how a modern hip replacement is performed and what a patient can expect during his or her recovery. 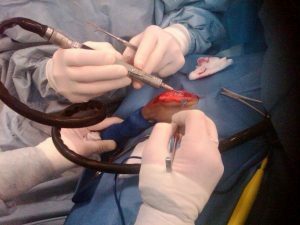 As discussed in the article, in the 1990s, having a total hip replacement involved a having an open incision followed by a stay in the hospital of two weeks or more and then being placed in a lengthy rehabilitation program. There was a lot of time spent in rehabilitation, and this was not only a long, but also a painful process. Today, things are generally done with less invasive procedures, and the patient will likely go home that day or the next. There are a variety of reasons to get patients out of the hospital as soon as possible. One reason is that the less time a patient spends in the hospital following surgery, the less chance he or she will develop a serious and potentially deadly staff infection. If a patient develops a staff infection in the hip joint, it will likely have to be removed until the infection can be suppressed and this can take a long time. It should be noted that most staff infections are not the fault of the hospital. Even the cleanest hospital is a risk for post-surgical patients. Doctors will take multiple scans of the patient prior to the procedure, so he or she will have a detailed map of exactly what is going to happen. The goal is to have as precise a fit as possible with the smallest scar possible. The doctor can then use 3D printers to make the hip or even program the map into a robot to perform the actual surgery. However, as our Boston hip replacement injury attorneys can explain, regardless of the amount of skill of the surgeon and other health care workers, and the high level of technology used, if the artificial hip device itself was defectively designed, there is a very high chance that there will be complications, including, but not limited to, total device failure. These artificial hips will not last forever, but they are supposed to last between 10 and 20 years, depending on the device. For this reason, if you are told you need to have your artificial hip replaced less than five years after having it implanted, you should contact an experienced products liability attorney. Absent a traumatic injury or another rare complication, having a total device failure three years after the surgery likely indicated a manufacturing defect. While this is not true in every case, it is suspicious enough to indicate that there may be a problem and that it is a problem worth investigating.